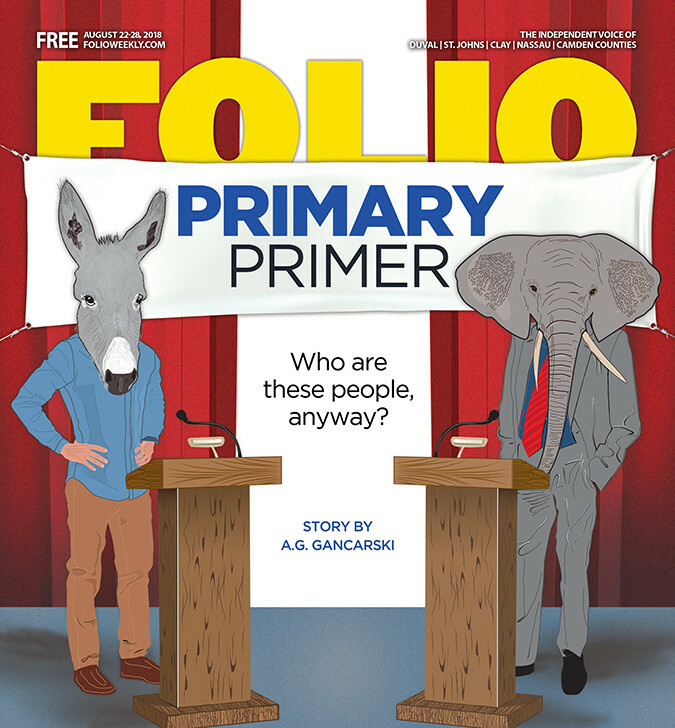 With primary early voting well underway in Dirty Duval and the other counties in Folio Weekly’s distribution area, there is no better time than now (at least, in our publication schedule) for a long-form explainer. However, those were her “Quick Picks.” She had good reason to pick certain politicians, including but not limited to their generous contributions to printing costs. We have no reason for such, alas. No endorsements of any of these candidates should be implied from the foregoing. Whether you are a Democrat or a Republican, you have some interesting choices this year. On the Democratic side, the polls say former U.S. Rep. Gwen Graham will pull through in a “Gwen vs. the Men” race. A good way to piss off her supporters? Compare Graham to Alex Sink, the last moderate woman to run for governor statewide (Rick Scott defeated her eight years ago). Or to Hillary Clinton, who lost Florida and lost the White House to President Donald Trump. Graham’s appeal is rooted in “common sense” solutions. She wants increased gun control. She’s fine with medicinal marijuana (though, unlike the evolving consensus among Democrats, not yet fine with legalization). She’s opposed to algae blooms, though is uniquely ill-positioned to attack Big Sugar, given that she had accepted money from the industry early on. She’s been buoyed by establishment Democrat endorsements, a legacy (FUN FACT: She’s Bob Graham’s daughter. To jog your memory: He was our governor from ’79-’87 and a U.S. Senator from ’87-2005), a sense of inevitability, and a field that cannibalizes votes from each other. This might be a different race if Jeff Greene and Philip Levine weren’t occupying the same ideological space, or if Chris King weren’t in every debate and forum with 3 percent of the vote in every poll (thus cannibalizing Andrew Gillum’s vote share). But no one really cares how you win. It’s if you win. And, as Adam Putnam can attest, inevitability isn’t a sure thing these days. Consider the Republican side of the ledger, where Ron DeSantis looks poised to take the nomination away from “Amnesty Adam,” who’s apparently been running for governor since he was 5 years old. All the Tallahassee lobby backing he wanted. A complete willingness toward self-abnegation to the gun lobby, displayed most vividly in the “I’m a proud #NRASellout!” tweet. Eight years in Gov. Scott’s Cabinet as Ag Commissioner. Policy positions on every major issue, many of which present a problem because they were consensus in the George W. Bush era Republican party; they have since been purged from GOP orthodoxy. Putnam, in a pre-Trump era, would’ve been the prohibitive favorite. However, in 2016, Putnam said what he actually thought about Trump, calling him “vile and obscene” and stalling on declaring support for him until the GOP Convention. While Putnam has spent the majority of the last two years attempting to make good, Rep. Ron DeSantis (who represents those of you reading this in St. Johns County) ensured that didn’t happen. Trump has stumped for and with DeSantis (calling him a ‘brilliant cookie’). His campaign organization is also supporting DeSantis. So are all of your favorite Fox News personalities. And, of course, there’s that ad showing DeSantis teaching his kid how to read with a Trump campaign sign (“Make America Great Again!”) and reading passages from The Art of the Deal to another kid. Will GOP primary voters, who have been conditioned in this state to regard Trump as the agent of their deliverance, buck that imprinting and vote against the President’s Man? These are the same voters who bounced Marco Rubio in the presidential primary, then voted for him to go back to the Senate. Until proven otherwise, assume they will do what the president says. FUN FACT: This month, Putnam won the Jax Young Republicans straw poll over DeSantis, 75-2. This is a measure of the local investment in Putnam, which is deep. HOWEVER, Lenny Curry is backing DeSantis—more sand in the eye for his friends here? FUN FACT 2: However it ends for Putnam, he had some well-written one-liners aimed at DeSantis during the Jacksonville debate. The Florida Dems compiled an email of insults from the debate and sent it to media. Rest assured you’ll be seeing that footage again. There is some rather interesting action on both sides of this race. On the Democratic side, there really is one plausible candidate, in the form of state Rep. Sean Shaw. Shaw, the son of Leander J. Shaw, a former Florida Supreme Court Justice, is a compelling speaker, has an understanding of the law as it has evolved in Tallahassee, and is really the only hope Democrats have to roll back the Pam Bondi era. Republicans, meanwhile, have two plausible options. Ashley Moody, the former Hillsborough County judge, would be Pam Bondi Part 2. If that’s your thing, you probably aren’t getting election tips from the altweekly, except perhaps who not to vote for. Moody’s endorsed by virtually all the elected Republican sheriffs, the police unions, and a phalanx of elected state attorneys (though not Melissa Nelson, who has a … conflict … given her former political team is handling Moody’s opponent’s campaign). Rep. Frank White, a Pensacola lawyer who is largely funded via family money, does not have the raft of institutional backing that Moody does. What White does have is the consultancy of political assassin Tim Baker, who seems uniquely able to handle running dozens of campaigns in state and beyond by knowing how to tap into the ids of Republican voters. White is defining Moody as a “liberal,” noting that she was a registered Democrat in her youth and that she was involved in a civil action against President Trump. Will that message be enough to carry? White’s team thinks so. FWIW: Democrats who want to pick up the AG office likely want to run against White rather than Moody. White, however, has the scarier political operation, which is why the race is where it is. Check out how they got Jay Fant out of the race. Then they hired Fant’s operatives. The Republican side of this contest features three candidates worth mentioning: Baxter Troutman, Matt Caldwell and Denise Grimsley. This race feels like it’s been going on for 90 years, with an endless potpourri of folksy appeals from all three candidates. Why not? It worked for Putnam eight years ago. At this writing, Undecided is killing them all in the polls. On the Democratic side, readers of Folio Weekly will likely be most interested in Nikki Fried. Fried is an advocate for the cannabis industry, which is a BFD for those who see cannabis policy as a metaphor for freedom in other areas. The downside for Dems: Fried, as Politico reported, has given money to a LOT of Republicans, including Putnam, Moody, J.E.B. Bush and local 2016 state House candidate Sheri Treadwell. She told me just the other day that those were gifts of “friendship,” rather than political affiliation. Some are … skeptical. Also, out of all the candidates I talked to during this cycle, Fried is the most genuine and least-scripted. She has that rare gift of being able to talk policy conversationally. She has a future beyond this campaign. The question that Fried voters will face is familiar to Democrats: Is it worth it to support a genuine reform candidate who can win—overlooking her willingness to do business with Republicans? This question is especially familiar to Democrats in the next race. Can Jacksonville take back Corrine Brown’s seat from Rep. Al Lawson? That, at first glance, is the question posed by former Mayor Alvin Brown’s challenge to the Democrat from Tallahassee. A closer look at this race, which finally heated up as August began, reveals a more complex narrative. Alvin Brown, who governed as and ran for re-election as a self-described “conservative Democrat,” has evolved into a self-described “pragmatic progressive.” He wants to end Stand Your Ground (a state issue the feds won’t call the shots on) and he wants to reform ICE (a position that Lawson seems to share). Lawson, who’s beloved by many Florida Republicans, is taking an interesting tack with his messaging in this market. Namely, his position is that Alvin Brown “failed” as mayor. Lawson points out that Brown didn’t get LGBT rights through a Human Rights Ordinance expansion, even as Brown seems to be amending the historical record by saying that he supported the HRO expansion (rather than, as Johnny Gaffney and others claimed, tried to kill the bill). Brown-era budget problems and the choices required are also under scrutiny. Violent crime, still surging, began its uptick in the Brown era, a time when low cash flow caused cuts in cops in addition to everything else. Police and fire unions back Lawson, who is happy to push their narrative. Also of interest in this tug-o-war: The oppo pushed by Lawson, regarding matters like Brown letting Eureka Gardens become a national story, and Brown spending more than $300,000 on a security detail. It almost sounds like it could have a Republican source. Speaking of Republican sources, Brown is in the unusual position of getting GOP money, including funds from charter school kingpin Gary Chartrand and old friend Shad Khan (who, reliable sources say, bristled when Lawson did not come to Jacksonville to kiss Khan’s ring). The district, of course, is a simple math problem. Can Brown get enough turnout and support here to outweigh Lawson’s support out west? This is why Lawson is spending so much effort trashing Brown’s performance as mayor—a voter suppression technique that worked for Lenny Curry in 2015 and, the bet is, can work in the current scenario. Lawson beat Corrine Brown out here by roughly a 60-20 margin, with a spoiler candidate in the race in 2016. If Alvin Brown can somehow get 80 percent of the local vote, perhaps energized by the governor’s race or something, he may be able to make it a closer race district-wide than the nine points by which Lawson won. Does he have the juice to win? That’s a question of mobilizing turnout, and he’s never had to do that independently of the Corrine machine, which helped him big league in 2011 and 2015 both. The only public poll of the race (a St. Pete Polls’ survey) has Lawson up 50-28. And Lawson asserts FiveThirtyEight.com gives him a 99.8 percent likelihood of winning. Private polls likely look the same: 37 members of the Congressional Black Caucus, including the chair and Brown’s political mentor Jim Clyburn, endorsed Lawson. Physically, Brown is carrying himself like he did at the end of the mayor’s race against Lenny Curry. He somnambulated through a pivotal AME church forum a couple of weeks back, too. Not optimal. DID YOU KNOW? Both Brown and Lawson seem to favor marijuana legalization. During a Tallahassee Democrat interview, they cited Denver and Colorado as models. Let’s not hold in our bong hits too long waiting for either to file a bill in this direction, though. There are two interesting and competitive primaries worth a closer inspection. The first is the Democratic race in House District 14 between School Board chair Paula Wright and incumbent Demonbuster Kim Daniels. Wright is the second straight credible Democrat to face Daniels in a primary. The first was two years ago, when lawyer Leslie Jean-Bart lost after a campaign that included altercations over sign placement. Wright doesn’t seem to have that much juice. In a forum a couple of weeks ago, at which Daniels was a no-show, she pointedly avoided attacking Daniels. Daniels would have shredded her had it been the other way around. Wright has the backing of elected Democrats, including Councilman Garrett Dennis, Sen. Audrey Gibson, and Rep. Tracie Davis. That’s the good news. The bad news: Daniels, in addition to having more of a killer instinct, has the backing of the Republican machine in what is an open primary (with no Republicans or NPA candidates qualifying). And intangibles: Consider the raw, libelous hit piece on Wright the Florida Star ran a few weeks back. However, Daniels has been spending money on incidentals during this campaign, and no-showing forums. Additionally, Wright has a political committee messaging outside her campaign account. It’s gonna be close, also, per at least one poll we’ve seen. FUN FACT: The Florida Chamber considers Daniels the most business-friendly Democrat in the House. Likewise, police and fire unions back her as well. And she’s a preacher, which means that should she need to lend her campaign money, there is liquidity as there was in 2016. If the Dems can’t take the seat from apostate Daniels, it raises interesting questions about how strong the party actually is. The other competitive primary is in House District 15 on the Republican side. Lobbyist Wyman Duggan is Lenny Curry’s man in this one, facing Joseph Hogan (whose positions include opposition to sharia law, a major concern on Jacksonville’s Westside) and yacht broker Mark Zeigler (known for drumming in Pretty Boy Freud). Duggan has the endorsements and the moolah. Hogan has the famous name. Zeigler is the only one of the three with a sense of rhythm. The oppo has gotten brutal here, with a political committee sending our mailers noting Duggan lobbied during the latest JEA sale discussion. Will voters care? Duggan is the only one of the three on TV. Fant’s district before he gave it all up for a performance art project/Attorney General candidacy). In this case, however, Tracye Polson—who has capital, backing from the state party, and a team that’s been focused on canvassing for months before the GOP side even started working—awaits in the general. Polson will be the litmus test for the local blue wave, and she may be successful—the district has gotten more purple of late.